Which pump should you use? D5 or DDC? Our support is usually bombarded with questions about the differences between D5 and DDC. 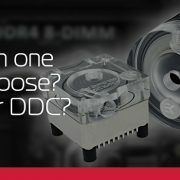 In this article, we take a closer look at D5 and DDC pumps. https://www.ekwb.com/wp-content/uploads/2015/12/d5_or_ddc.jpg 370 705 Atila Gobor https://www.ekwb.com/wp-content/uploads/2015/12/ekwb_logo.png Atila Gobor2016-11-11 14:24:592017-03-23 14:49:06Which pump should you use? D5 or DDC?